Did the holidays bring you new gadgets? Here’s how to recycle your old ones. Electronic gadgets were at the top of many holiday shopping lists again this year, with iPads and Kindles fueling a lot of the buying frenzy. The biggest sellers were e-readers, tablet computers, smart phones, HD TVs and video games consoles and accessories. The Consumer Electronics Association was predicting that the average consumer would spend $232 on electronics this holiday. So what should you do with the old stuff – the items these shiny new gadgets replaced? Or the even older ones – the dead cell phones, PDAs, and iPods stashed in your dead gadget drawer, or the old printer or TV tucked away in the basement? It’s pretty easy to keep a recycling resolution, with the help of the Electronics TakeBack Coalition’s Guide To Recycling Your Electronics. Here are the basics, with a lot more information available on our web based Guide. There are often good options for reusing your old electronics. If your old item still works and is pretty current, it can probably be reused. Old tube TVs are usually the exception here, but computers and phones will probably have some reuse value as whole products or parts. Many cities have local, non-profit reuse organizations, which will refurbish electronics for use in local underserved communities. You can usually find these by contacting your local county solid waste agency. If you don’t find one, consider the National Cristina Foundation, which matches donated computers to charities and agencies, or World Computer Exchange, which sends requested working items to educational institutions in developing countries. If reuse is not an option, then please take it to an electronics recycler. Please make sure your old product gets to a responsible recycler – one who will actually recycle it, and not ship it off to a developing nation, where old electronics are causing terrible health and environmental harm. The best way to do that is to work with a recycler who is part of the e-Stewards network. E-Stewards recyclers adhere to the highest standards in the industry, including a firm commitment not to export non-working or untested e-waste to developing nations. If there is no e-Steward near you, then there are many takeback programs run by the manufacturers and retailers, most of which are free. See our website’s Guide to Recycling Your Electronics for information and links to all of these programs. Some of these programs have trade-in options, which will give you money back (or credit towards purchases) for certain items, especially cell phones and laptops. 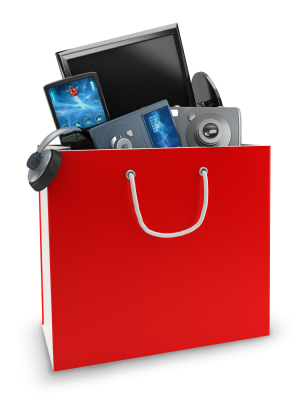 The Electronics TakeBack Coalition’s Guide to Recycling Your Electronics includes details on these trade-in options as well.